Almost 34 years later, the PATCO story lives on as fodder for politicians. In Collision Course, I wrote about Gov. Scott Walker's references to Reagan's handling of the PATCO strike as an inspiration for his attack on public sector collective bargaining in Wisconsin, which led to the passage of Act 10 in 2011. For me, that story happened thirty years ago, in August 1981. The air traffic controllers, in violation of their contracts, went on strike. President Reagan ordered them back to work, making clear that those who refused would be fired. In the end, thousands refused, and thousands were fired. I recall this pivotal moment for another reason as well. 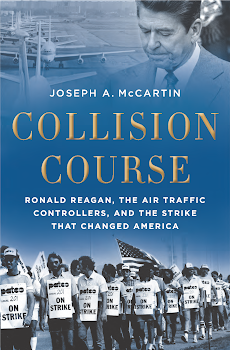 Most Americans at the time and since no doubt viewed Reagan’s firm handling of the PATCO strike as a domestic matter, a confrontation between the president and a public sector union. But this misses a critical point. To quote a phrase from another American moment, the whole world was watching. The speech in which Christie told this story was one that was touted as giving Christie's foreign policy views. Tellingly, Christie's foreign policy speech never mentioned Iraq, Iran, or Afghanistan, and said precious little about the state of the world. Instead it dwelt on the PATCO strike as a moment when America sent a message of strength to the world in the Reagan era. 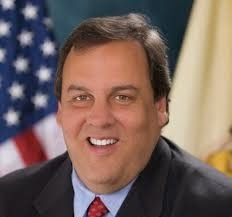 The breaking of the strike was, in Christie's view, apparently foreign policy triumph above all else. One of the most powerful foreign policy decisions I think that was made in our lifetime was one that Ronald Reagan made early in his presidency when he fired the air traffic controllers which would seem to be a solely domestic policy but what it did was it showed our allies around the world that we were serious and more importantly ... to our adversaries that we were serious. Years later, documents released in the Soviet Union showed that that exactly was the case. The Soviet Union started treating him more seriously once he did something like that. Ideas have to have consequences. In fact, no such Soviet era documents referred to by Walker actually exist, as an investigation by Politifact found. 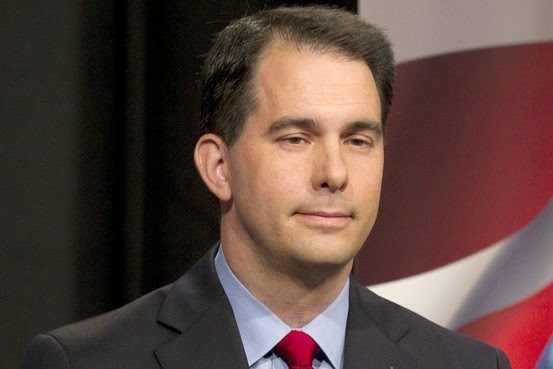 In her Wall Street Journal column on Feb. 28, 2015 former Reagan speechwriter Peggy Noonan took issue with aspects of Walker's story, including his allusion to Soviet documents that have never been found. Even in doing so, however, she herself mischaracterized PATCO's story. Twice in her column she claimed controllers sought a 100 percent increase in pay in 1981. That is far from true. PATCO's story continues to be told in twisted ways by most public figures that invoke it. While the Reaganites themselves were hopeful that the PATCO story would have an impact on the Soviets--as I say in my book and as Walker and Christie suggest--there is no documentary evidence that it had the supposedly intended effect. It is notable that those who trumpet the strike as a foreign policy triumph have much less experience in foreign policy than they do in making war against public sector unions and collective bargaining. I suspect that in their misty image of Reagan, neither Walker nor Christie can wrap their minds around the fact that Reagan was less opposed to unions in the public sector than they have been. Unlike Walker, Reagan never concluded that public sector collective bargaining itself was misguided. He simply believed that an illegal strike by federal workers could not be tolerated. They have an excellent history . specially Collision Course is more informative . I like it thanks. Air Traffic Controllers in the 70's and 80'a had every right to be very unhappy with working conditions and the state of of the equipment they were forced to overcome to accomplish the mission; the safe,orderly and expeditious flow of air traffic. I was a tower/tracon controller at the time of the strike. I felt that I had a moral and legal requirement to either stay or resign. With 25 years invested, I stayed. "They can't fire is all" appears to have terribly wrong for some very good friends of mine, not to mention some really outstanding controllers.